As is very often the case with great ideas, it was first inspired among the bookshelves. Browsing Barnes & Noble one day in the Spring of 2016, Erin Bried—an industry vet whose lengthy Condé Nast career had come to a layoff-induced end just months earlier—was disappointed by the retailer's selection of magazines aimed at girls like her daughter, who was five-years-old at the time. "It was 'Frozen' and 'My Little Pony,' and all of these teeny bopper magazines with stories about having good manners and pretty hair and navigating friend drama," Bried tells Folio:. "It kind of simmered with me. I felt there was so much more that we could offer girls; there’s such a bigger, brighter vision of the world with so much more possibility, and no one was showing them that." As the days and weeks wore on, that moment in the newsstand aisle—and the idea that all girls, including Bried's own two daughters, deserved to be shown a world in which they could grow up to be not a princess or a pop star, but a scientist or a senator—simply wouldn't leave her mind. "I kept turning it over and over until I realized that I shouldn’t just wait for somebody else to do it," Bried says. "If you want to see something change, change it yourself. Having spent my entire career as a magazine editor, I thought, who better than me?" Aimed at girls aged 5–12 and attracting contributors like Ruth Bader Ginsburg, Jane Goodall and Ellen DeGeneres—and most recently honored as the first-ever children's title to earn a National Magazine Award for General Excellence—Kazoo isn't just elevating the way we, the media, speak to girls. Three years and a dozen 64-page quarterly issues later, it's also showing us what a profitable, 100-percent reader-funded magazine can look like in 2019. Folio: sat down with Bried to learn more about Kazoo's mission, its business model and how she brings it all together. Folio: Let’s go back to that night at the National Magazine Awards last month. What was your initial reaction when your name was called? Erin Bried: We got our first nomination back in 2017; we had only put out a few issues at the time, and we entered all of them. That was such an honor and so validating. And then when we were nominated again this year, we were in such good company in our category, with The Hollywood Reporter, Smithsonian, Audubon and the Columbia Journalism Review. It’s a dream to even be considered their peer. I didn’t think there was any chance that we would win. Folio: Why do you think, in this day and age, something like Kazoo didn't exist already? Bried: Why, in this day and age, are there not more women in Congress? Why, in this day and age, are there not more women in leadership positions in science? Why are there not spacesuits that fit women yet? Why has nobody done this? We're working against a very big system, and it's hard to change things when the system is working for the people in power. It's past time for things to change. Before I became a parent, I sort of lived in this world where I assumed every woman would be a feminist, having spent my career at Glamour and Self and Women's Sports & Fitness. I just took it for granted. Then you become a parent and you walk down the toy aisle and you start watching kids movies and you look at girls' fashion versus boys' fashion, and it's so shocking, the differences between what we're offering girls and boys and the message we're sending. Folio: Given your experience in the industry, you knew what a massive undertaking it was to launch and then sustain a magazine. What made you believe you could pull it off? Bried: We launched the Kickstarter in July of 2016, and a few months prior to that, I had just been laid off from Self. So after spending almost 19 years at Condé Nast, I was suddenly completely free. I had nothing to lose, and I believed in the idea so much. It seemed like such an obvious idea. That’s one of the reasons I went to Kickstarter, because I wanted to make sure that we had a big enough audience who was as passionate about this idea as I was. When I was first planning it, I met with some people who said it would never work. If we named it Kazoo, we would be misshelved with the music titles. Or if you’re producing a magazine for girls, it should be run as a non-profit. I was so annoyed by that idea—that a magazine for girls had to be run as a charity. So I was kind of fueled by the naysayers and I wanted to prove them wrong. Folio: Clearly, the Kickstarter campaign proved successful. Bried: We raised $171,000 in 30 days; we were Kickstarter's highest funded journalism campaign in history at the time. One of our first donations was from Roxane Gay, and I remember seeing that come in and dancing around my kitchen table. And then Neil Gaiman picked it up and started tweeting about it, and that was really helpful. It was just incredible. Folio: Were you surprised by how quickly it took off? Bried: I was floored by the response. About two-thirds of our Kickstarter backers were people who had never used Kickstarter before. We had more than 3,100 total backers, and I think of them as almost like our co-founders. We would not be here without those 3,100 people putting their faith in me, that I could make a magazine that would be worthy of their kids. So I feel such a great responsibility to them and to all of our subscribers to make a great magazine, to make it fun and something that the kids can learn from. Folio: Why was it important to produce it as a physical magazine? Bried: If my kids see something on the internet that they love, they ask me to print it out for them. They want to hold it in their hands, and I wanted Kazoo to be an experience. There are pages to cut out, pages to write on. You can’t do that with an iPad. And what’s more, no parent wants their kids looking at screens for longer than they already are. It creates this need for instant gratification, and as a parent, I don’t like that. So I wanted to give kids a tactile experience, something they can hold in their hands and use and make their own. Folio: What are some of the ways that Kazoo's mission comes through in its content? 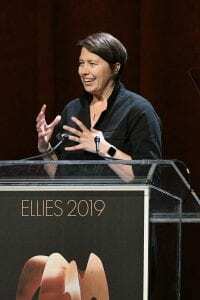 Bried: We develop every story with the top woman in her field, because representation matters. Girls need to see powerful women doing amazing, powerful things. And they don’t get that in any of their other media. We want them to just take for granted that a woman can be a Supreme Court justice or an astronaut or a marine biologist or a marathon runner. We just want it to be so matter of fact that they, too, can be all of these things. But when girls reach a certain age of adolescence, that self-doubt starts to creep in, and that’s when you see their self-confidence plummet. That’s when they start dropping out of sports and stop raising their hands in school. That’s when they stop seeing themselves as a leader. So with Kazoo, I wanted to reach girls at this young age, age 5–12, to shore up that foundation and to help them see the world as full of possibilities, so that when they get older, they’ll be able to stay true to themselves and fend off that self-doubt. Folio: What’s something that you will never see in Kazoo? Bried: You’ll never see a photograph of a girl. That might sound strange, but we decided early on that we wanted our readers to get lost in the experience when they’re reading the magazine. We never wanted them to be in a situation in which they would have to compare themselves to other kids. 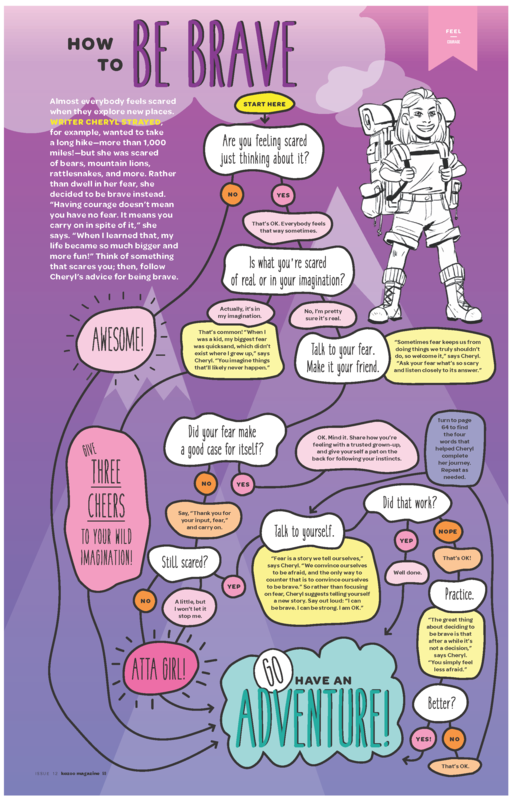 So we take all of our experts and we illustrate them as they were as girls, so our readers can see what a future chef or engineer or astronaut looks like, and they’ll see that she looks just like them—she has a patch on her knees and she’s wearing a hoodie and she has a ponytail. We collect childhood photos of all of our experts and give them to our illustrator. 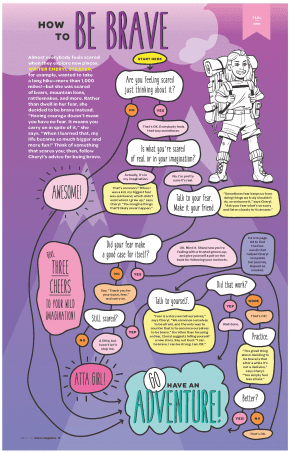 Folio: Speaking of those experts—Margaret Atwood, Shonda Rhimes, Elizabeth Warren—why do you think you've had so much success getting them to contribute? Bried: I have been so touched by the response. Almost everyone we’ve asked has said yes, and we’re a tiny magazine. We don’t offer a lot of glamor, but when I explain our mission to people, they are so eager to jump in and help. And I learn from that, too, because these are powerful, busy women, and they always take time out of their schedule to help girls through the same doors that they passed through. Folio: Has any page or feature in particular stood out from over the first 12 issues? Bried: With every story we do, we ask, “What makes this Kazoo? Why is this a story in Kazoo, and not in Ranger Rick or Highlights or Nat Geo Kids?" Part of that answer is always the expert we have attached to the story. 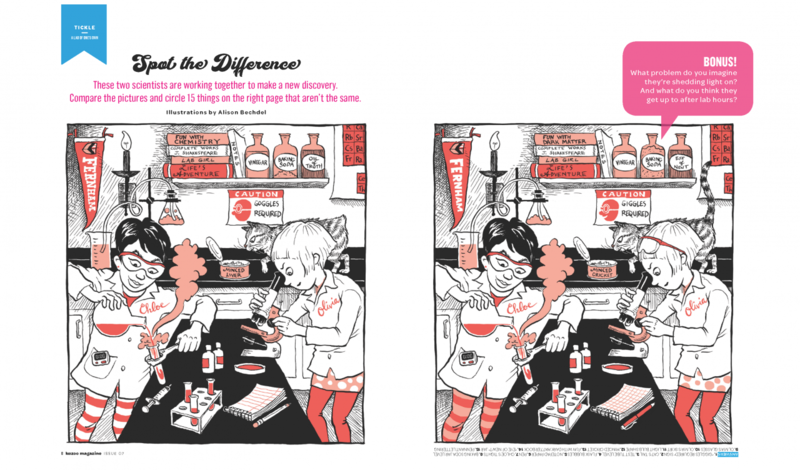 We did a “Spot the Difference” in the activities section in our 7th issue, and we had Allison Bechdel illustrate it, based on a passage in Virginia Woolf’s “A Room of One’s Own,” which [was the essay that] formed the basis for the Bechdel test. So it had an extra layer of meaning. Nothing is ever random, there’s always something more to it that makes it Kazoo and makes it feminist and empowering for girls. Folio: You also feature kids’ submissions in the magazine. Bried: We get a lot of reader mail, and we write back to every kid who writes to us and we send everybody a sticker. That’s the most gratifying part of running a magazine for kids, to have these kids write us letters in their handwriting and send us pictures and tell us what they want to see in the next issue. It’s the best part of my day, going to the mailbox, so we wanted to give them a chance to be in the magazine and to have their voices heard in the pages, too. Folio: Does that go back to that same idea of representation? 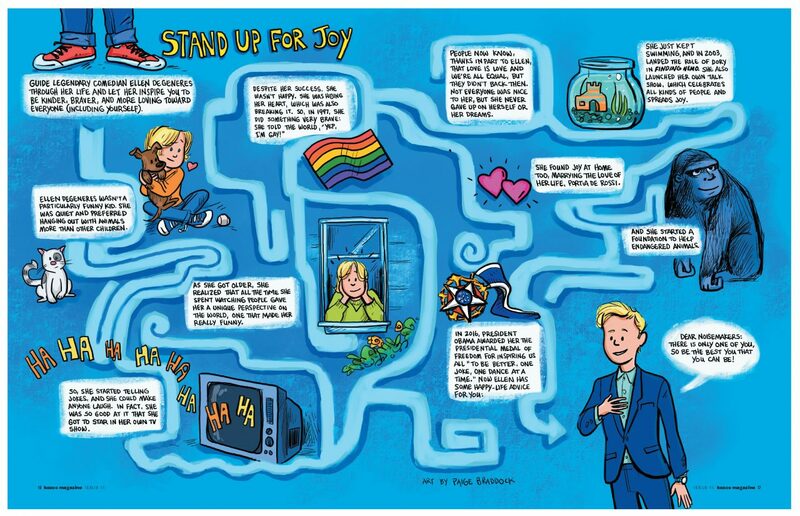 Bried: Yes, and to celebrate our readers for being who they are. Some kids send stories, some send drawings, some send jokes. Our mission is about celebrating girls who are being true to themselves, and we want to show all sorts of ways to do that. Folio: Why was it important that the magazine be totally free of advertising? Bried: That was so important to me, as a parent. I want kids to feel whole after reading Kazoo. I don’t want them to feel like they’ve gotten the magazine and have learned all of these interesting things, and they really need to buy some product in order to be happy. It’s totally antithetical to our mission, to introduce these wants for whatever product. I also wasn’t interested, whatsoever, in relinquishing any control over what was in our pages, and we don’t have to. We are 100-percent subscriber-funded, and we’re doing it. It feels so good not to be beholden to anyone else and to be able to be pure in our mission. I think advertising would just muck that up. Folio: You also donate a number of copies of each issue. Bried: Yes, we donate to FirstBook, which gives books to children in underprivileged neighborhoods and schools. To date, we’ve donated $30,400 worth of magazines to them. That’s one of the amazing things about running your own magazine: you get to do business the way you want to. We are lucky enough to be successful and to be able to give back. That’s really important to me, to be a good member of the business community as well as a good member of the media. Folio: Is this the model that will sustain print magazines moving forward? Bried: I think so, absolutely. When I look back at my career, no magazine that I’ve ever worked at still exists in print. That’s mind-boggling to me. I was at Glamour when Glamour was the “cash cow of Condé Nast.” In running a small magazine that’s completely subscriber-supported, we are turning a profit and we’re growing every day. Granted, we’re not doing $75,000 photo-shoots. We have no office. I work from home. We have a lean budget, and that’s okay. We don’t sacrifice our quality just because we’re small and scrappy. 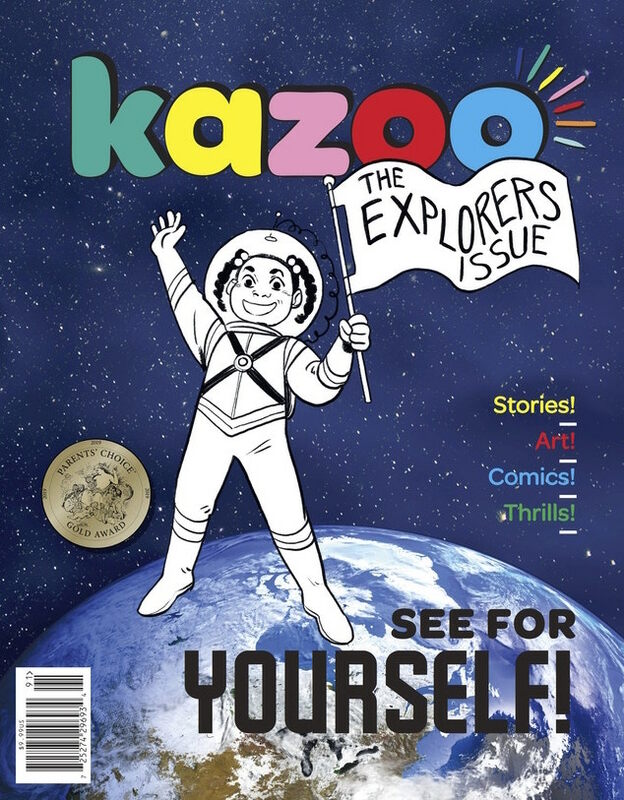 I hope that Kazoo can be a story that inspires other magazine editors and writers and publishers to bust out and do it, too. Even if it’s a small one, if you can find an audience that’s as passionate as ours, you can’t lose. The post Ad-Free, Print-Only and Profitable, Kazoo Is Pushing Girls to Think Bigger appeared first on Folio:.